Evolution of the present El Niño pattern. This chart shows changes in Pacific Ocean temperature anomalies over the past year, with longitude along the x axis and time on the y axis. Well, after months of indecision, El Niño has finally decided to establish itself. 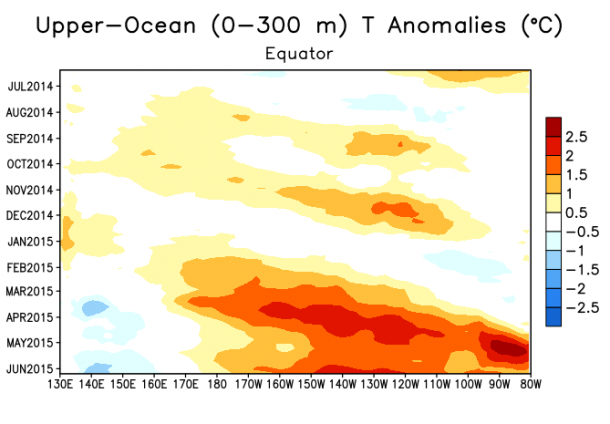 Simply put, El Niño is when the waters of the Pacific Ocean become abnormally warm. This has far-reaching effects on tropical and even global climate. The primary effect of El Niño is drastically increased rainfall across the Eastern Pacific Ocean and the southern United States. We’ve already seen this with the devastating floods in Texas and Oklahoma. By contrast, in the Western Pacific, rainfall is drastically reduced, often leading to drought and wildfires in Australia. So, what does this mean for the hurricane season? Well, during El Niño years, the spike in ocean temperatures typically increases tropical cyclone activity in the Eastern Pacific. Outflow, the stream of high-level clouds and winds, from these storms combined with enhanced westerly flow aloft into the Atlantic Ocean, typically leads to unusually high wind shear, or change in wind speed and direction with height, across the Atlantic Basin during the heart of hurricane season. High wind shear is a death sentence for a tropical cyclone. It tears them apart from the top down. This is why El Niño years typically see much fewer hurricanes in the Atlantic. A major El Niño event in the early 1980’s effectively knocked out two Atlantic hurricane seasons. There were just ten storms in 1982 and ’83 combined, with a record low four in 1983. However, El Niño isn’t a guarantee that we’ll get off scott free. One of the four storms in 1983 was Hurricane Alicia, which caused major destruction in the Galveston area of Texas, killing 21 people and causing $2.6 billion in damage ($6.2 billion in 2015). In 1992, just seven storms formed the entire season following a strong El Niño the previous winter. However, one of those storms just so happened to be Hurricane Andrew, which was the most destructive hurricane in US history at the time, causing damage conservatively estimated at $26.5 billion ($44 billion in 2015). Some estimates run as high as $34 billion ($57 billion in 2015). Up to 62 people died. Hurricane Betsy, in an eerie foreshadowing of Katrina, left large portions of New Orleans underwater. Betsy struck near the peak of a strong El Niño, with +1.7 deg C ocean temperature anomalies present in the Pacific. El Niño statistically reduces the number of storms in the Atlantic, but how much does it really reduce the risk of a destructive hurricane? The fact is Mother Nature doesn’t follow a rule book. Since 1950, ten Atlantic hurricanes have killed at least 60 people during El Niño conditions. Nine caused over $1 billion in damage, a number that grows to eleven when inflation is taken into account. 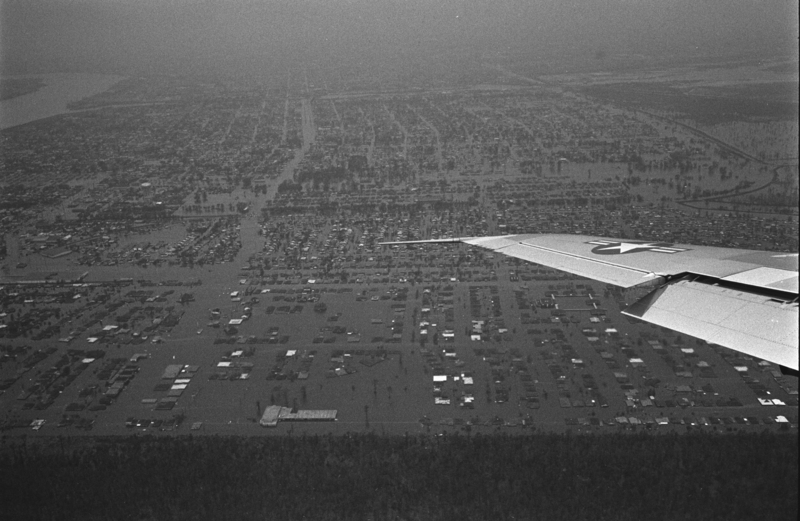 Audrey devastated southwestern Louisiana during the El Niño of 1957. Flora caused catastrophic floods in Haiti and Cuba that killed over 7,000 people in October, 1963 during a moderate El Niño event, making it one of the deadliest hurricanes in Atlantic history. 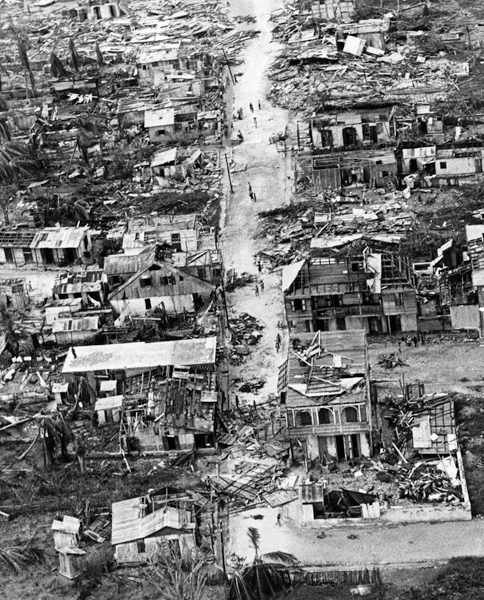 Betsy became the first hurricane to cause over $1 billion in damage during the heart of a strong El Niño event in 1965 that resulted in just a six-storm season. Camille occurred during a weak El Niño and Agnes, which caused devastating floods across the eastern United States that killed 129 people and was the costliest hurricane in history at the time ($3 billion, $17 billion today), occurred during an even stronger El Niño. Gordon killed 1,100 people in Haiti during the El Niño of 1994. Damage in Haiti from Hurricane Flora. Flora was the worst hurricane in Haiti’s history and the sixth deadliest Atlantic hurricane on record. It occurred with a +1.2 Pacific Ocean temperature anomaly. Most surprisingly, however, all of the incredible devastation of the 2004 season occurred under weak El Niño conditions that peaked at 0.8 deg C of Pacific warming during the August-September-October time frame. This may explain why the 2004 season became remarkably quiet after mid-September. However, that still didn’t stop Jeanne from plowing into Florida as a major hurricane on September 26. It’s also worth noting that Hurricane Sandy occurred during a brief spike in Pacific Ocean sea surface temperatures (a +0.6 anomaly) that, while not officially classified as an El Niño, was within El Niño parameters for approximately 3-4 months from August into November. The most common examples of major storms in inactive years that I mentioned earlier, Alicia and Andrew, in fact occurred on the backside of weakening El Niños. When Alicia formed, conditions were in fact transitioning to La Niña. All of the others I just mentioned happened with at least 0.5 deg C of Pacific warming, the official boundary of El Niño. Betsy occurred with an astonishing +1.7 deg C warm anomaly present in the Pacific. That year’s El Niño reached peak intensity just a couple of months later. Looking at the statistics, there have been a total of 45 billion-dollar hurricanes in recorded history. Nine of them, 20% of the total, occurred during El Niño (+0.5 deg C or greater). Nineteen happened during neutral conditions (+0.4 to -0.4 deg C), and 17 were during La Nina (-0.5 deg C or lower). Of the 35 storms that have killed at least 100 people since 1950, 28.6% of them (10 in total) happened during El Niño. Nine storms have caused at least $1 billion in damage and/or 100 deaths in the United States during El Niño (Audrey, 1957; Betsy, 1965; Camille, 1969; Agnes, 1972; Bob, 1991; Charley, 2004; Frances, 2004; Ivan, 2004; Jeanne, 2004) out of 33 total events (28%, expanding the data set to storms with 50+ deaths for the purpose of the chart above adds only two storms…Carol and Hazel of 1954…but reduces the El Niño percentage down to 26%). That means over a quarter of major destructive tropical events happened when conditions were climatologically unfavorable for tropical cyclone development. Since 1950, there have been 409 hurricanes in the Atlantic Ocean. 33 of them ultimately produced major destructive events in the United States (50+ fatalities and/or $1 billion in damage), or approximately 8%. Eleven of those events occurred under La Niña conditions (2.7%), while nine occurred under El Niño conditions (2.2%). So, based on the past 64 years, El Niño’s presence has reduced the chances of a devastating tropical event by a whopping 0.5% over the dreaded La Niña. Yee ha! All this highlights the danger of writing off an El Niño year. The tropics, like nature in general, are fickle. You simply cannot expect any particular hurricane season to simply pass quietly into the night. It only takes one. This entry was posted in Uncategorized and tagged El Nino, hurricanes, weather. Bookmark the permalink.